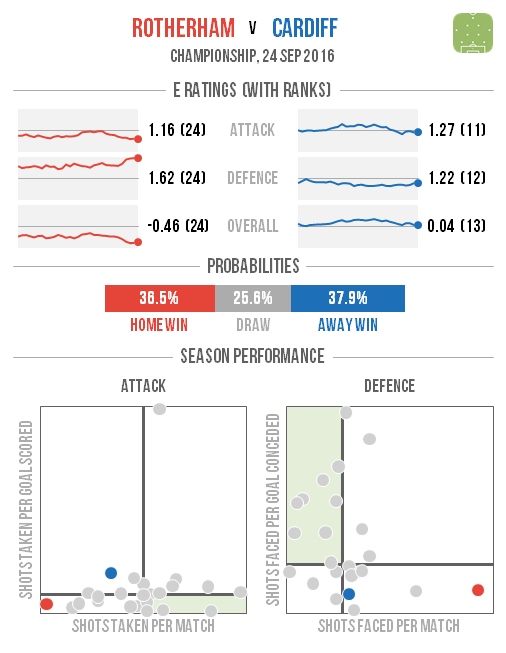 This weekend I’m restarting my regular preview graphics for each EFL match, which were a regular feature last season. 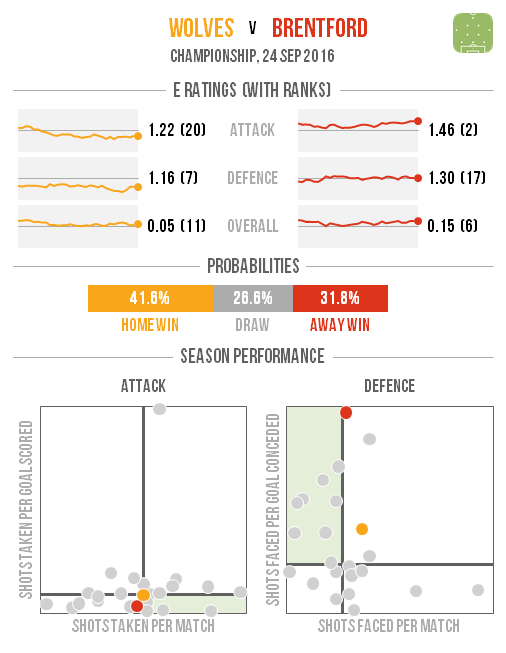 The Friday evening game looks most likely to end in a Preston victory, with the hosts’ defence still looking solid enough to compensate for a quiet attack. 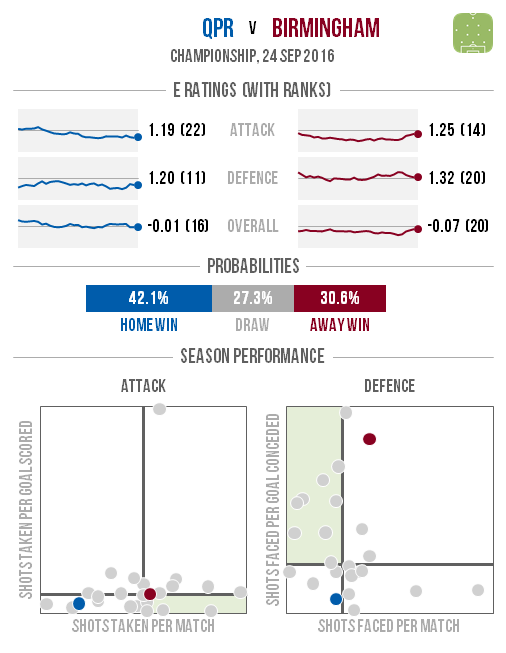 Wigan have made consistent improvements in their performances, but seemingly not enough to overcome hosts who look capable of a top half finish. 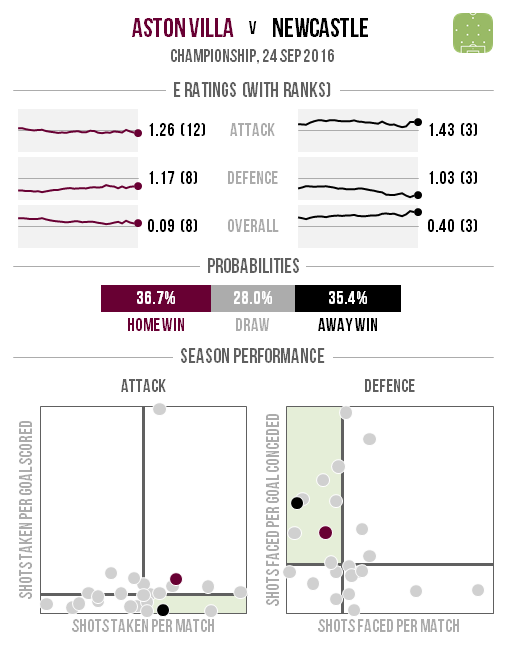 Newcastle have been faring better than Villa since both fell out of the Premier League last season, with the home attack in particular enduring a frustrating start. 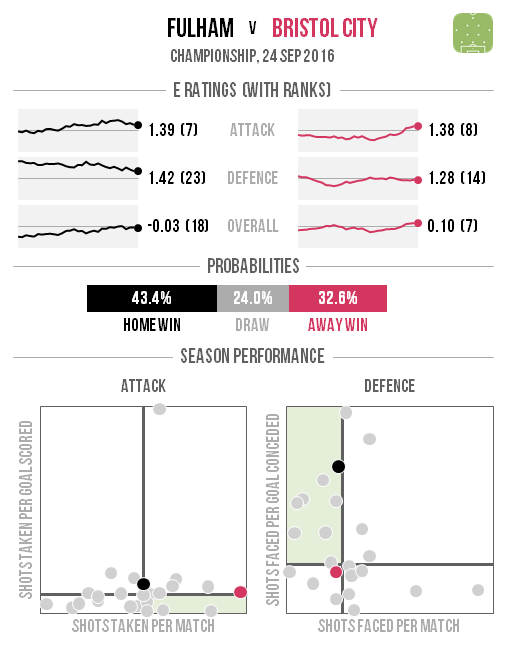 The Magpies have been far more clinical and their defence has also been among the best in the division, so this presents a stern test of how well the home side are gelling. 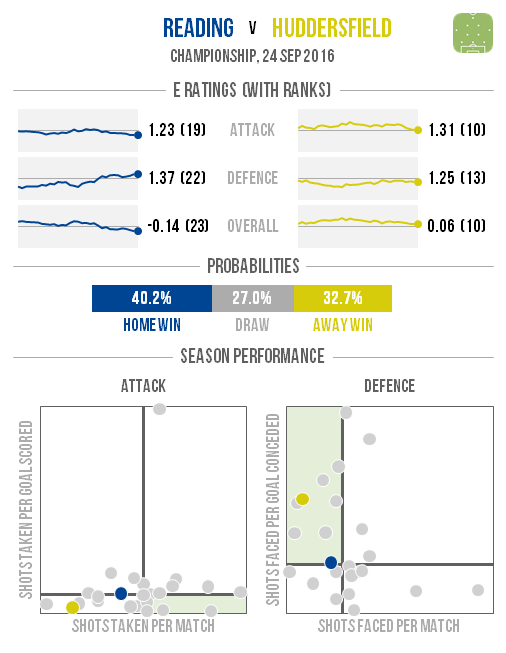 This match features two of the division’s most rapidly-improved sides, with both seeing their ratings rising strongly of late. 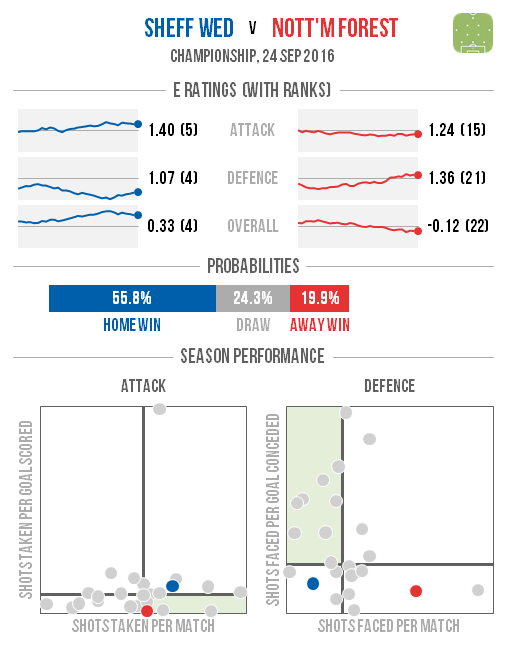 Brighton are the most formidable performers at both ends overall, while newly-promoted Barnsley are building from a lower base. 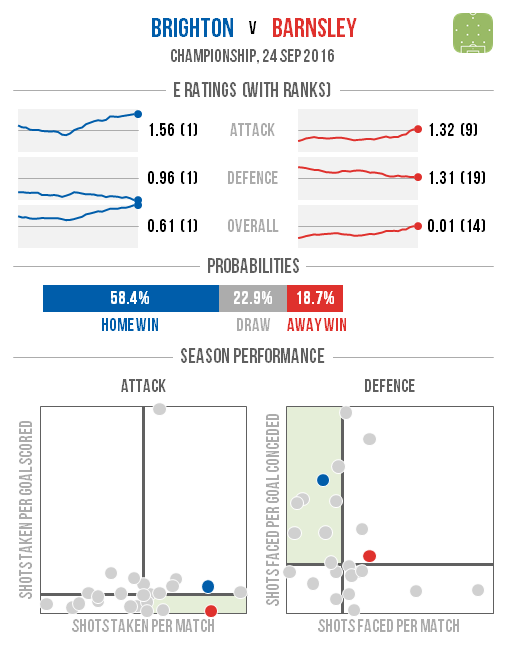 The Tykes have shot even more frequently than their hosts this season and more clinically, so it will be interesting to see how they fare against an incredibly resilient home defence. 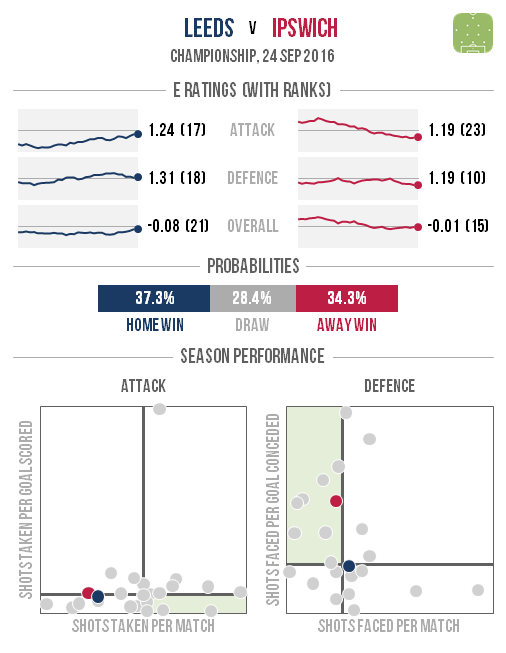 Both of these clubs have seen their attacking output dwindle, with Derby looking worryingly blunt under Nigel Pearson this season while Blackburn’s decline has been more gradual. 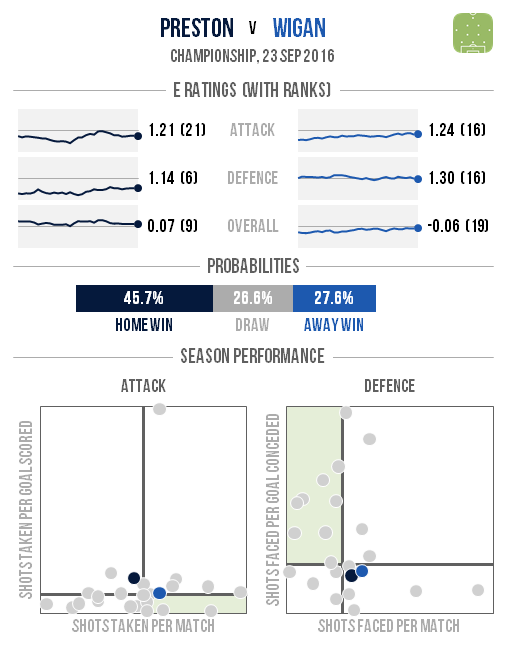 The Rams are due some luck in front of goal and may get it against the division’s leakiest defence, while their own strong back line looks capable of keeping the visitors at bay. 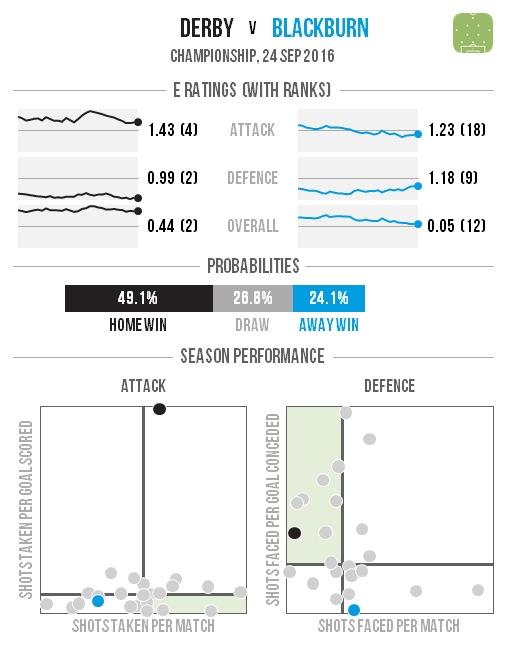 Fulham’s defence has improved since last season and is soaking up plenty of punishment at the moment, but is likely to receive a stern examination from the division’s most shot-happy attack. Bristol City’s forwards are having far more fun than last season and they look capable of a top half finish at the moment, so this will be a tough game for the Cottagers. Ipswich would have been the favourites in this fixture a year earlier, but Leeds are showing early signs of improvement under Garry Monk while the visitors have gone backwards. The Tractor Boys’ attack is a shadow of its former self while their hosts’ front line is gradually discovering some fluency, although neither side has rattled in many chances so far. Coupled with the away defence being among the most resilient, goals could be in short supply here. Two of the division’s more consistent performers meet here, with Norwich the unsurprising favourites. 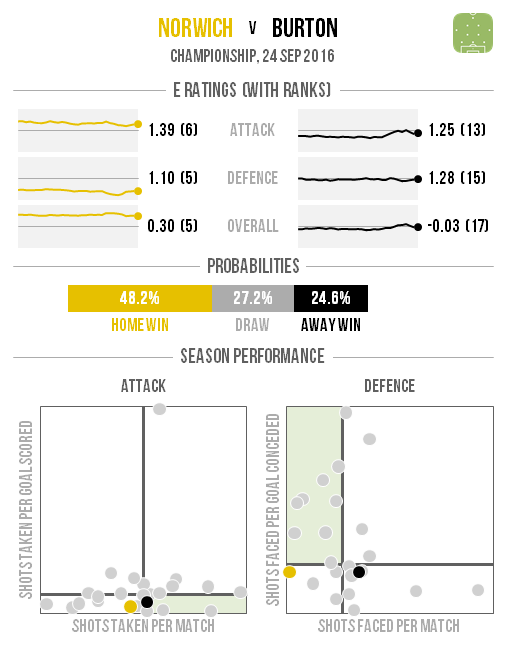 To their credit, Burton haven’t looked out of their depth at this level and should be capable of a safe bottom half finish, although against the Canaries’ clinical attack and forbidding defence they are likely to struggle. The E Ratings have long been suspicious of Birmingham but the Blues’ performances appear to be improving in line with their league position this season. Their defence has soaked up an impressive amount of punishment – unlike QPR’s – and with their hosts struggling to create chances look capable of taking something back with them from West London. Both of these clubs appear to be overachieving at the moment, with Reading’s performances looking suspect under Jaap Stam and Huddersfield having dropped off a little from the strong showing which had led to them being tipped as “dark horses”. Some clinical finishing has masked a quiet attack so far, but with their hosts looking shaky they could well remain at the top of the table for at least another week. This match could be pivotal for both clubs’ campaigns. Rotherham look to be in severe danger of relegation already, having taken fewer shots and allowed more than anyone else. Cardiff are one of the few teams sitting beneath them in the table thanks to their own deteriorating fortunes, but won’t get many better chances to turn them around. Despite some mixed results so far this season, Sheffield Wednesday still look capable of securing another play-off finish based on their underlying performances. Visitors Forest sit just above the Owls in the table but have seen some clinical finishing mask some very concerning defensive displays. Each of these clubs has looked more assured at one end of the pitch than the other, with Wolves solid at the back and Brentford very dangerous up front, so it will be interesting to see whose stronger suit prevails here. The Bees have absorbed a heroic number of shots for each goal conceded, but it’s unclear how long they can keep that up for.